The T-50 in a standard Soviet camouflage. An X-Ray View of the T-50. As to armour protection, the 40 mm (1.57’’) thick frontal glacis is sloped under the angle of 52°, the frontal side “cheeks” has the same thickness and 54° slope, and the lower frontal glacis is 45 mm (1.77’’) thick with a slope of 55°. Both upper and lower side armour is 40 mm (1.57’’) thick, with the upper side armour being sloped under 40° degrees. Upper rear armour is then 25 mm (0.98’’) thick with a slope of 61°, while the unsloped lower rear plate has again the thickness of 40 mm (1.77’’). Turret’s front and sides are then protected by 40 mm (1.77’’) of armour as well, with the gun mantlet’s slope varying between 7-52°. Commander’s cupola is 40 mm (1.77’’) thick as well, and the top armour, both on the turret and on the hull, has thickness of 15 mm (0.59’’). 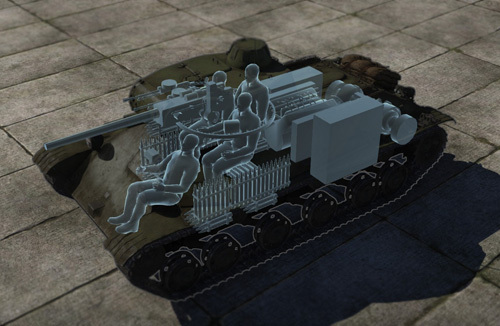 Regarding firepower, the T-50 can utilize three armour-piercing round types. At the point blank range an depending on the angle of attack (AOA), the default BR-240 APHEBC round is able to penetrate up to 62 mm (2.44’’) of armour against the flat armour, 55 mm (2.16’’) while faced by an armour sloped under 30°, and 25 mm (0.98’’) at 60° AOA. At the maximum range of 2 km (6562 feet), the default round’s penetration values then decrease to 26/23/10 mm (1.02/0.91/0.39’’). The first unlockable round, BR-240P AP round is able to penetrate up to 73/65/26 mm (2.87/2.56/1.02’’) of armour at the point blank range, and 17/15/6 mm (0.67/0.59/0.24’’) of armour at the range of 2 km (6562 feet), giving you better short range penetration in exchange for worse long range performance and a lack of explosive filling. The second unlockable round is then BR-243P APCR round, which is able to penetrate up to 103/79/23 mm (4.1/3.11/0.91’’) at the point blank range, and 17/13/3 mm (0.67/0.51/0.12’’) at the range of 2 km (6562 feet). Coming as a successor of the BT-7, the T-50 retains excellent speed and agility, but with much better armour protection. The frontal glacis is virtually immune to autocannons and smaller caliber rounds of other light tanks, and at the long range, it can deflect even larger projectiles. However, the tank has two major disadvantages. The first one is extremely slow turret traverse, which will hamper your attempts to lead fast targets (such as other light tanks) and will significantly lower your response time. The second weakness is the gun. While adequate against reserve vehicles and low tier light tanks, the 45 mm gun will struggle against medium tanks such as M4 Sherman or PzKpfw IV Ausf.F2, which you can penetrate frontally only at short range, thus forcing you to rely on flank shots. And due to BR 2.7, you will face both tanks that you can destroy easily, and tanks that have significantly better armour and firepower. That said, a good T-50 driver must be very adaptable, as he needs to adjust his play style according to which opponent he faces. With high mobility, strong frontal armour, but rather weak armament, the T-50 can be challenging experience, but in a hands of determined player skilled in improvisation, it can do wonders. It will also serve you as a last vehicle from the tech tree before entering the legendary T-34 medium tank series. 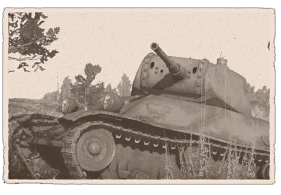 In 1939, the development of the replacement for already obsolete T-26 light tank was issued to OKMO design bureau, attached to Factory No.185 in Leningrad. Technical specification called for weight of 14 tonnes (30 865 lb), main armament consisting from 45 mm (1.77’’) gun and 45 mm (1.77’’) thick sloped armour. 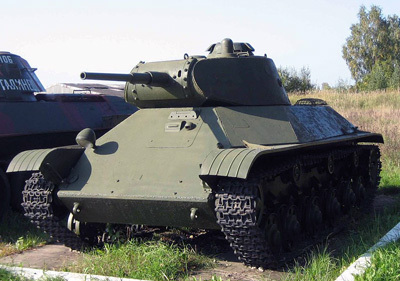 First prototype of the tank, designated T-126SP (abbreviation for Soprovzdheniya Pekhoty, “Infantry Support), was completed in the summer of 1940. The vehicle possessed excellent frontal armour protection for a light tank, and other advanced features compared to earlier Soviet designs, such as a five-man crew, commander’s cupola, radio as a standard equipment, or a three-man turret. It was armed by a single 45 mm (1.77’’) main gun and two 7.62 mm (0.3’’) machine guns, and it was propelled by the inline 6 cylinder V-4 engine, producing 250 horsepower. T-50 at Tank Museum in Kubinka. Trials however discovered multiple issues, such as extremely cramped crew compartment and poor power-to-weight ratio. Based on trial results, the frontal armour thickness was reduced to 37 mm (1.46’’) in order to reduce weight, the number of crewmen was reduced to four, a more powerful V-4 diesel powerplant was installed, and other small modifications were made. Modified tank was designated as the T-127SP, and after successful trials and some other modifications, it was approved for serial production as the T-50, with the production starting in April 1941. However, in time of the German offensive in June 1941, only approximately 50 T-50 tanks were produced. The production was extremely slow not only because of high costs, but mainly because of issues with the V-4 engine. The powerplant, designed specifically for the tank, suffered from extremely low reliability, and all attempts to improve it failed. Furthemore, a British Valentine infantry tank was supplied to Soviet Union via Lend-Lease from autumn 1941 on, and proved itself to be a better infantry tank than the T-50. Soviet officials thus decided to discontinue the T-50 production, and focused on the mass production of other tanks. Only 69 T-50 tanks were manufactured, including a small number of T-50s with applique armour bolted onto the frontal glacis. The vehicle was used operationally, but details about its service are not known. It was supposedly deployed in defence of Leningrad, and most of them were most likely lost quickly, either due to enemy action, or because of mechanical issues. Would you like to find out more about the T-50?  Be sure to view the War Thunder Wiki article! What do you think on this little, agile vehicle? Leave a post with your experiences in the comments!